Growing catnip is fairly easy to do. You don't need to have the proverbial green thumb. Just follow some simple tips and you will soon be growing your own cat-nip. And as you may already know, catnip has a very strong effect on most cats. Felines simply adore it. Growing your own catnip will certainly keep your kitty very happy. Here you will find information and tips on how to grow catnip. But before we start with the fun stuff, let me tell you a little bit about this herb. Catnip is a perennial herb of the Nepeta family. Catnip is in fact a mint and it is closely related to peppermint and spearmint. It has soft leaves, small purple and white flowers, and a strong aroma. When fully grown, cat-nip can reach up to 3 feet in height and it grows in almost any type of soil. In fact, this perennial behaves pretty much like a weed, and it can spread very quickly. So keep that in mind before you start growing it. Don’t worry if you are not an expert gardener. Cat-nip is very easy to propagate. Just follow the tips shared here and you will soon have a nice harvest. There are different approaches to growing catnip. You can use seeds, stem cuttings, and seedlings. So choose the easiest method for you. The best time to plant cat-nip seeds is in the spring after all danger of frost has passed. Catnip grows in almost any type of soil. However, it will grow best in average, well-drained soil. Catnip prefers partial to full sun, though it tolerates some shade. If you're using seeds: Use a spade to loosen the soil to a depth of 6 to 8 inches. Plant the cat-nip seeds directly into the soil in rows. Place them 5 to 6 inches apart and cover them with a thin layer of soil. Water them slightly. Cover the seeds lightly. However, allow for enough air to reach the seeds/plants. A mesh screen is a good choice. 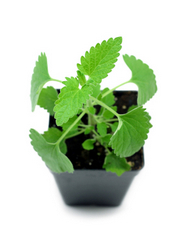 Young catnip plants are tiny and quite delicate so keep them as protected as you can. Keep them away from your cat until they are fully grown. You can also start your planting indoors by placing your seeds on a pot (or several pots). Seeds germinate within 7 to 10 days at room temperature. You can later transplant the plants to your garden or yard. Water your catnip regularly but do not over-water. Want to skip the seed-planting stage? Buying healthy seedlings from a nursery is a great alternative. You can also buy a catnip kit. CatNip Plus is a good option to help you get started. If you're staring with seedlings, plant them 15 to 18 inches apart. Catnip can easily develop mildew, so keep the plants well aired. Catnip and catmint can spread like a weed. It can quickly overtake your garden! It is a good idea to contain you catnip plants to a designated area, away from other plants. 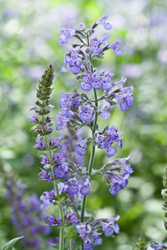 Cat-nip has a pungent aroma, so keep that in mind when you select a spot to grow your catmint. This is especially important if you’re growing catnip indoors. Don’t have a garden or a yard? Live in a tiny apartment? Don’t worry, you can still grow cat-nip. If you have a nice planter and a window that gets enough sun, you’re all set. Just make sure that you water your plants(s) on a regular basis. You can also build or buy an indoors hydroponic garden. Hydroponics is a method that allows you to grow plants without soil. Instead you use other growing mediums (water, sand, gravel) and nutrient solutions. An easy way to grow catnip indoors is using a cat-nip kit. Blooms in a Bag Organic Catnip Edible Cat Treat Garden Kit is one of the many choices you will find. You can start harvesting catnip when the plants are flowering and the leaves reach 18 to 20 inches. Cut as many leaves as you want or need and let them dry. Some people dry the cat-nip leaves in the oven. If you use this approach, be careful not to burn them. You can place the dried leaves in an airtight container until you’re ready to use them. Catnip leaves can be used as food seasoning. Many people use it to spice up soups, sauces, and meats. This herb makes a fairly good insect repellent. 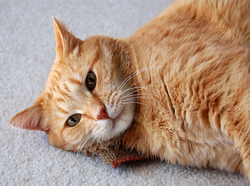 Indeed, catnip essential oil can be used to repel flies, mosquitoes, and even roaches. You can use catnip leaves and flowers to make tea, which I’ve heard is quite relaxing. Catnip tea can also be used for its medicinal virtues. Some people use it to relieve headaches, fever and other pains. However, keep in mind that there is no scientific evidence to confirm the medicinal effectiveness of catnip.